Just as manufacturers rely on robots to reduce human errors and maintain product quality, so too are surgical robots alleviating fatigue while aiding procedures requiring great precision. The high cost of surgical robots has been a barrier to adoption, but more hospitals are deciding that they’re worth the investment. The equipment can help surgeons perform minimally invasive operations, from which patients can recover more quickly and easily than traditional procedures. In 2009, Penn State Milton S. Hershey Medical Center began establishing best practices for medical centers using surgical robots. 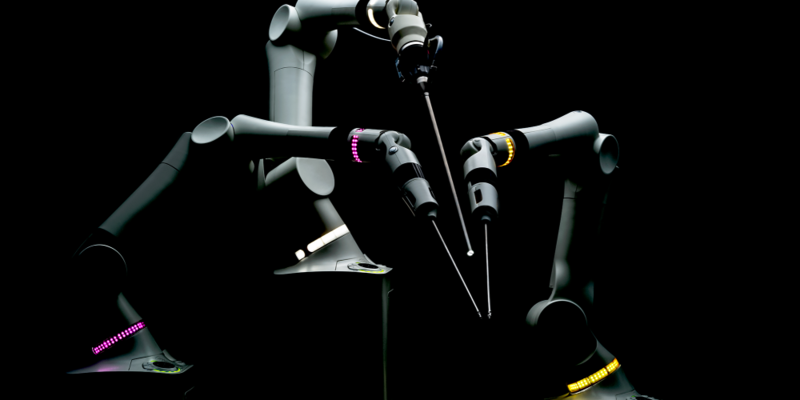 The Journal of the Society of Laparoendoscopic Surgeons noted that the facility initially used robots for only a small assortment of procedures. However, the diversity of uses has increased over the years, with the most growth in gynecology and urology. While the medical center has used Intuitive Surgical’s da Vinci brand of robots, it has expanded its use of automation to better serve patients. Many people struggle with the finances for surgery, and some travel to specialized facilities to receive the best available care. Therefore, the priority that the Penn State Milton S. Hershey Medical Center is putting on automation could be an example of how hospitals can gain competitive advantage with surgical robots. The da Vinci surgical system is a market leader, but other options are emerging, including models for specific procedures. Since some key da Vinci patents recently expired, other companies could seize market share. Here are four new surgery robots likely to appear in more operating rooms in 2019. Surgeons must have steady hands, especially when dealing with delicate areas such as the eyes. The University of Oxford has conducted a trial of PRECEYES Surgical System. The test involved 12 patients who needed membranes removed from their eyes or had a buildup of blood underneath the retina due to age-related macular degeneration. Half of the people got conventional procedures, while the others received robotic surgeries. All the surgeries were successful, but the robotic approach was at least as successful and was sometimes even more effective than doing the procedures manually. In 2019, there are plans to use the surgical robots to dispense gene therapy to the retina. One problem for people living in remote areas is getting access to urgent medical care, especially with a shortage of skilled surgeons at the local hospital. Fortunately, robotics — combined with other technologies such as virtual reality (VR) — is helping surgeons prepare. They can practice in the virtual world before there’s a patient on the operating table, which is helpful for complicated procedures. Sometimes, VR combines with haptics to help users get tactile feedback that brings more realism to these practice sessions. In addition to enabling doctors to get on-site training, the CorPath System from Corindus Vascular Robotics allows for remote surgery. The company described it as the first remote telerobotic interventional platform. In a recent case in India, a cardiovascular surgeon performed a 15-minute procedure on a patient who was approximately 20 miles away. The doctor used the system to insert a stent into the patient while operating the robot from afar and monitoring the progress on a screen. The CorPath System depended on high-speed Wi-Fi. Surgeons standing by with the patient were available to step in within about 30 seconds in case of an outage. Remotely controlled surgical robots could benefit patients who are too ill to be transported to a location where an expert surgeon is available. Developed by Auris Health Inc., the Monarch is a surgical robotics platform that incorporates flexible robotics, micro-instrumentation, data science, and other technologies for therapeutic and diagnostic bronchoscopic procedures. “We believe that the Monarch Platform represents the next era of medical intervention that will enhance physicians’ capabilities and dramatically improve clinical outcomes for patients by accessing and treating disease through the body’s natural openings,” stated Eric Davidson, vice president of sales and marketing for Auris. He added that the Monarch platform is the first of its kind. It integrates endoscopes, instruments, navigation, and robotics into a single platform, allowing physicians to better conduct endoscopic interventions. Furthermore, Davidson said Auris wants Monarch to be the first robotic endoscopic platform to serve multiple disease states for both diagnostic and therapeutic intervention. Right now, Auris’s website says the company’s primary disease target is lung cancer. Looking to the future, Davidson said the company is exploring its opportunities outside the U.S. in 2019. A healthcare provider in Hamilton, Ontario, recently received the first robot approved for knee surgeries and will start using it on patients in January 2019. The Mako Rio makes a 3D model of the procedure based on the patient’s CT scan and provides real-time feedback as the surgeons use specialty instruments. The hospital also hopes to use the surgical robot for hip replacements. Operations on the hips and needs require surgeons to carefully place implants inside the patients to help them eventually regain mobility. The 3D modeling component also allows surgeons to plan each stage of the surgery before it happens. This could help them review approaches in it more ways than they could otherwise. The U.K.’s National Health System has said the Versius, considered a direct competitor to the da Vinci system, could improve care for patients and plans to use it next year following a European health and safety approval. CMR Surgical’s Versius, like other surgical robots, performs laparoscopic surgeries, also known as keyhole procedures. According to one source, human surgeons need about 80 hours of training to learn the manual method of laparoscopic suturing. However, they can learn it in about a half hour when doing the technique with the Versius. The robot mimics the human arm and is designed to be easy to move between operating rooms. Moreover, there’s a program under way at a Florida training center to teach 27 surgical teams with more than 100 professionals how to use the Versius technology. Cambridge, England-based CMR Surgical also helped with nine weeks of U.S. Food and Drug Administration (FDA) validation studies and plans to launch the equipment stateside next year. The long development times, safety requirements, and high costs of surgical robots have already led to some consolidation, as seen with Medtronic’s acquisition of Mazor. These fascinating examples highlight how surgical robots are making things possible that surgeons likely didn’t even dream about a couple of decades ago. Even as fast as technology is evolving, surgeons don’t need to worry about robots taking over their jobs. After all, even in the case of the remote surgery mentioned above, humans are always guiding the surgical robots and specifying what actions they take. Their decision-making expertise is still essential to successful care. Kayla Matthews is a technology journalist and robotics writer whose work has appeared on Vice, VentureBeat, RoboticsTomorrow, and Robotiq’s blog. To read more posts from Kayla, visit her blog Productivity Bytes.